Shipping $8.30 Add item to cart for shipping estimate. You can SAVE on shipping by buying multiple items from the same seller. Shipping is charged by each individual seller. Sellers at times may also provide FREE SHIPPING on select items or on entire order if it meets the minimum order value. Please check sellers page for more details. Pure Copper Inside and stainless steel outside water Jug Pitcher. This pitcher brings the authentic dining experience at an Indian restaurant or at home. Storing water in copper jug is known to have ayurvedic health benefits. Shipping Cost $8.30 Buy multiple items online from Quality Indian Goods to SAVE on shipping. This item in Utensils from India category was first added to our catalog on 05-07-2018. 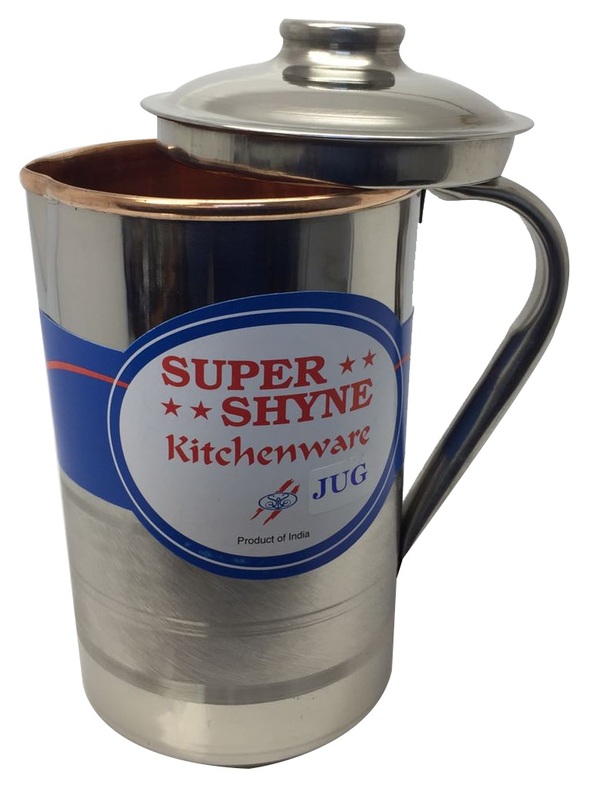 Buy Super Shyne Copper Stainless Steel Jug Pitcher w/ Lid & Handle, sold & shipped by Quality Indian Goods where you can shop online for Exclusive Collecton of Indian Cookware, Utensil, Religious Items & Gifts. This Jug Pitcher collection has been tagged as Supershyne Copper Steel Jug. Restaurant, Catering Banquet Hall, Tumbler, Water Mug Tableware.